Democrats advance tax hike in state Senate. Language to amend the state Constitution and enable a $3.4-billion tax hike on middle-income families and businesses was approved by Democratic state senators in a committee hearing on Wednesday, April 10. SJRCA 1 will allow the State to levy graduated income taxes on all income levels within Illinois. The graduated income tax constitutional amendment has been moved to the Order of 3rd Reading before a full vote by the Illinois Senate. House Republican Leader Jim Durkin reiterated his caucus’ unanimous opposition to the Pritzker tax hike. State of Illinois’ James R. Thompson Center to be offered for sale. One square block of space on Chicago’s LaSalle Street comes with the offer. The glass office building in downtown Chicago, noted for its open-frame elevators and vast atrium, will be offered to the private-sector marketplace. One possible outcome of the sale is that a developer will acquire the site, demolish the current Center, and lead a team of builders that will erect a taller skyscraper or skyscrapers on the same site. The market price of real estate on LaSalle Street has risen in value from what was spent to buy the site in the late 1970s when the Thompson Center was planned and built, and proponents of the sale assert that the site can be redeveloped to move it onto property tax rolls and earn a profit for Illinois taxpayers. A bill to move the sale process forward has been passed by the Illinois House and was signed into law on Friday, April 5. The Thompson Center sale process, if it takes place, will require extensive cooperation from a wide variety of Chicago-based power brokers, including but not limited to Chicago Mayor-Elect Lori Lightfoot. The Thompson Center building is physically tied to the CTA rapid-transit system and its Clark & Lake train station, which thousands of people use to go to work every day. One of the features of the Thompson Center sale bill is that any redeveloper must maintain the operation of the station, even as rehabilitation or demolition work is going on around the key transit point. The Thompson Center sale process is outlined in the bill. Preliminary planning includes goals for the removal of the current State employees in the Thompson Center to new locations. Some space is available in the State-owned Bilandic Building across the street, and other spaces can be garnered from currently underutilized State space, or by renting additional office space elsewhere in the Chicago area. The Thompson Center sale bill was passed through a highly controversial, partisan process. The bill, as passed into law, does not contain any provisions to ensure that any profits from the sale of the building are used to benefit Illinois taxpayers. The Illinois House vote on the bill was 67-48-0. Current law requires a driver to stop before meeting or overtaking (from either direction) a school bus stopped for the purpose of loading or unloading students. The law applies to any and all locations including, but not limited to, highways, roadways, private roadways, parking lots, and school property. A full stop is required if the school bus is displaying the visual signals specified in the code (i.e. flashing lights, stop signal arm extended, etc.) and the driver should not proceed until the visuals signals cease, the school bus resumes motion, or the school bus driver signals the vehicle to proceed. The law does not require a driver to stop on a four-lane highway when traveling on the opposite two lanes from the school bus. Passing a school bus while loading or unloading can lead to a driver’s license suspension. Currently, the Illinois Secretary of State will automatically suspend the driver’s license of anyone convicted of violating this law for a period of three months. HB 1873 provides that a first school-bus violation shall be subject to a mandatory fine of $300 (up from $150) and a second or subsequent violation shall be subject to a mandatory fine of $1,000 (up from $500). House Bill 1873 now goes to the Illinois Senate for consideration. Representative Mazzochi calls for annual report on tuition levels paid to Illinois public universities. 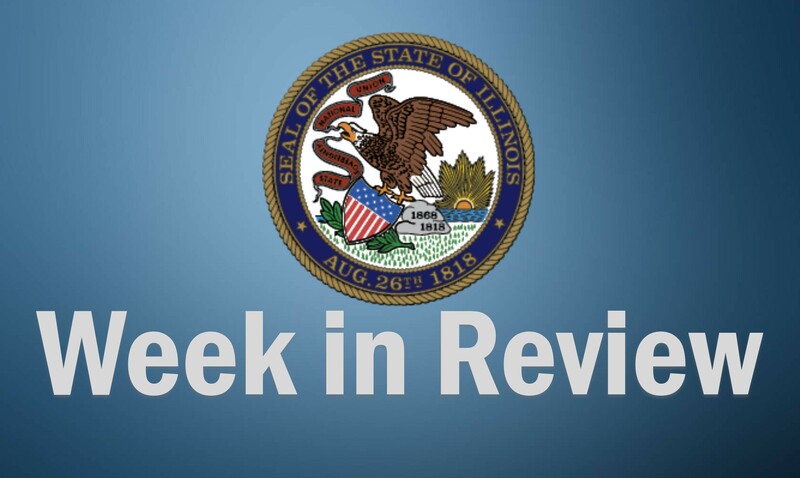 Rep. Deanne Mazzochi’s House Bill 2512 requires each Illinois public university to submit an annual report to the Board of Higher Education and the people of Illinois. The report must contain metric information on the percentage of undergraduate students who are receiving various levels of tuition relief. A wide range of tuition discounts are offered each year, sometimes openly and sometimes quietly, to a wide variety of students. As amended, HB 2512 breaks out undergraduate students into four groups: (a) the students who pay more than 75% of full tuition costs, (b) the students who pay between 50% and 75% of full tuition costs, (c) the students who pay between 25% and 50% of full tuition costs, and (d) the students that pay not more than 25% of full tuition costs. HB 2512 directs that the report contain anonymized information on how many students are classified in each group. Nothing in the bill would identify any individual student. The House approved HB 2512 unanimously on Thursday, April 11, and sent the measure to the Senate for further discussion and debate. House approves Representative Hammond’s texting-while-driving bill. Public health experts and first responders are pointing to an increasing number of crashes caused by distracted driving and texting-while-driving. Representative Norine Hammond’s House Bill 2386 gives new powers to a court that hears a case of texting-while-driving, when the act results in an accident causing great bodily harm to any person. The court is now directed to subject the violator to a minimum fine of $1,000 (up from as low as $75 in some circumstances). In addition, when a case like this occurs, and the violation results in a victim suffering great bodily harm, permanent disability or disfigurement, the Secretary of State may suspend or revoke the driving privileges of the violator. If the driving privilege is suspended in a case of this type, the suspension shall last for 12 months. The House passed HB 2386 by a vote of 82-24-2 on Wednesday, April 10, moving the bill over to the Senate for further discussion and debate. Renewed push for Scott’s Law awareness. Scott’s Law, the Illinois state law named in honor of a fallen first responder that requires motorists to move over when they see a parked first-responder vehicle, is getting more support from law enforcement and highway officers all over Illinois. Scott’s Law specifies first-responder vehicles that are displaying flashing lights of any color – red, blue, amber, or yellow. When they see the flashing lights, drivers are legally required to proceed with due caution, reduce the speed of their vehicle, maintain a safe speed for road conditions, and – of special importance – make a lane change, if possible, into a lane not adjacent to the parked first-responder vehicle. If the driver cannot safely change lanes because of other traffic, the driver must pass the first-responder vehicle very slowly. The Illinois Sheriff’s Association has informed Illinois motorists that starting on the second Friday in April, they will lead a week-long public awareness campaign aimed at better enforcement of Scott’s Law and a parallel State law against distracted driving. Hand-held phones and screens are often implicated in cases of distracted driving. Scott’s Law awareness campaigns are follow-ups to what is now a death toll of four traffic-related first-responder officer fatalities so far in calendar year 2019. Illinois has observed each of these deaths with statewide memorial observances, including requests that flags throughout the state be lowered to half-staff. The Scott’s Law push is part of the overall “Work Zone Safety Awareness Week” observance throughout Illinois, which seeks to increase driver awareness to protect law enforcement, first responders, and frontline construction workers. Laws that parallel Scott’s Law require that Illinois drivers observe lane closures, changes in traffic patterns, and reduced speed limits intended to protect Illinois road construction projects and road workers.